The 4K revolution is about to get personal. Key phones announced at Mobile World Congress quietly list Ultra HD video recording as part of their ever expanding armoury of features. This provision will not only change the way 4K can be viewed in the home (if users want to see just how sharp their footage is they'll need to run it into an external display), but reveal mobile devices to be a key piece in the 4K content puzzle. The simple fact is that Samsung's Galaxy S5 is poised to become the most popular 4K acquisition device on the planet. "The simple fact is that the Samsung Galaxy S5 is poised to become the most popular 4K capture device on Earth." As an adjunct to its 16MP camera, the Galaxy S5 will shoot 3840 x 2160 video at 30fps, using h.265. The incoming Sony Xperia Z2 also offers comparable 4K video shooting. During demonstrations in Barcelona, which saw a Z2 playing directly into a Sony 4K TV, the brand revealed TV engineers had contributed to the R&D when it came to enhancing the Xperia's 4K Triluminos colour fidelity. Ahead of MWC, LG also got into the act with the G Pro 2, another smartphone to proffer 4K. 4K video rendering has been seen as imperative by processor maker Qualcomm for some time now, and looks set to become a standard feature on high-end phones – and I think this advance could be game-changing. 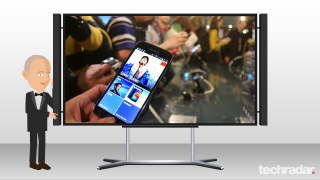 Typical usage will see home brewed 4K transmitted wirelessly to compatible displays using Miracast, or over wires using the newly announced MHL 3.0 standard. Although not immediately apparent, the arrival of MHL 3.0 is another vital evolution of the connected 4K eco-system. Until now, early 4K shooters like the Samsung Galaxy Note 3 were unable to display their UHD footage directly because limitations of MHL 2.0. This latest iteration offers a simple direct TV connection fat enough for 2160p30. Intriguingly, MHL 3.0 also supports HDCP 2.2 which could imply that a copyright secure 4K capable smartphone could also become a conduit for 4K streaming services, and not just 4K camcordering. Is the mobile phone now on a trajectory that will make it a rival to the set top box of the future? Could the smartphone kill the Blu-ray player? In a related development, ZTE also used MWC to show-off a pucker 4K capable TV box. The ZXV10 B803 employs new Broadcom silicon able to decode 2160p60 content using HEVC h.265. Indeed, something very similar was used by Netflix to demo its nascent 4K streaming service to me at CES 2014. Until now, STB decoding solutions have been locked at 2160p30. This Spanish cameo signals more widespread set top box production is becoming a reality - which in turn will ultimately open the doors to a Sky 4K TV service, but I digress. "Cinematographers can do things on a 4K shoot that simply are not be possible on other equipment"
Of course, the 4K recording boom isn't going to stop at mobile phones. The contagion will spread to cameras too. The new Panasonic GH4 can also shoot 4K at 2160p30. Footage can be played back into any 4K display using the miniHDMI output or distributed on SD card. Not that all 4K cameras will be created equal. There's far more to UHD than just pixel density, after all. One of the more extraordinary properties of the new wave of 4K cinema cameras is their astonishing sensitivity. Cinematographers can do things on a 4K shoot that simply are not be possible with lesser equipment. One scene in the Tom Cruise sci-fi outing Oblivion, which was shot on a Sony F65, has our hero illuminated by a single candlelight; nothing was fudged for this, there really was only one candle on set. Yet shadow detail is blisteringly sharp. Peter Suschitzky, who lensed M. Night Shyamalan's After Earth, was awestruck at just what could be achieved when shooting 4K in dense jungle. "I was full of wonder at the way the camera captures the image," he enthused. "It's so detailed and beautiful." It's probably fair to say you won't get the same result with a Galaxy S5. Can 4K save the strugglign TV industry?